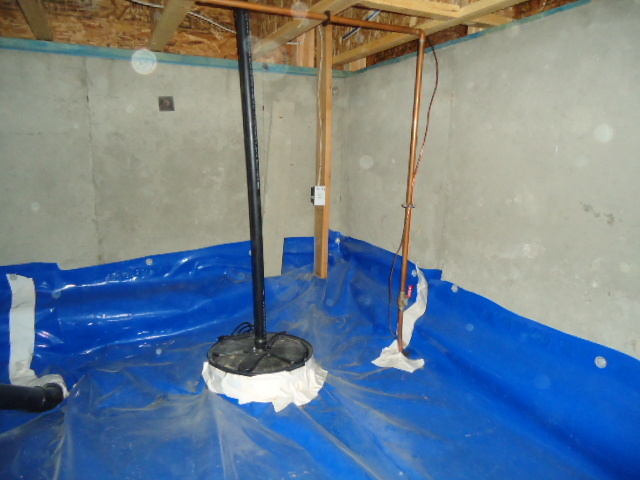 Sump pumps are self-activating electrical pumps that protect homes from moisture intrusion. They are usually installed below basement or crawlspace floors to remove rising groundwater and surface runoff before it has a chance to seep into the home. Accumulated water can cause interior damage and encourage the growth of mold, mildew and fungus. Pumps should be maintained and equipped with all necessary components in order to ensure their reliability. 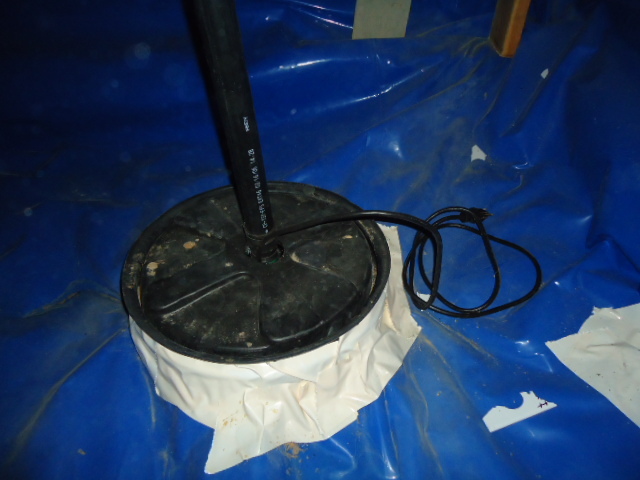 As you can see in the pictures this particular sump pump was not plugged into the electric outlet at the time of the home inspection. When plugged in to test it worked as intended. Why was the pump not plugged in? We don’t know the answer but a couple of thoughts might be that when this house was built 5 years ago they didn’t plug it in or the home owner who moved out last week unplugged it at some point. There was also an exhaust fan in the crawl space that was unplugged. Additionally the crawlspace was not insulated as is the case with most homes built recently. These items are surprising considering the fact that the pump, fan and heavy duty vapor barrier that apparently were installed in the crawl space at the time of construction. One can only guess that at the end of construction nobody ever went into the crawl space to make sure the job was completed or not. This is one of the reasons that even new homes should be inspected prior to closing for the buyer. Receptacle-type GFCIs are currently designed to allow for safe and easy testing that can be performed without any professional or technical knowledge of electricity. GFCIs should be tested right after installation to make sure they are working properly and protecting the circuit. They should also be tested once a month to make sure they are working properly and are providing protection from fatal shock. Thank you for taking the time to read this blog. If you have any questions let me know. Click here for a link to my website. These are checklists that you can use and incorporate into your routine home maintenance plan for your house. They are broken up into seasons. Hire a home inspector to perform a home maintenance inspection as part of your routine home maintenance plan. Change the air filter in your furnace. Keep in mind that all homes are different. Your home may have special needs that aren’t listed here. Electricity is an essential part of our lives. However, it has the potential to cause great harm. Electrical systems will function almost indefinitely, if properly installed and not overloaded or physically abused. Electrical fires in our homes claim the lives of 485 Americans each year and injure 2,305 more. Some of these fires are caused by electrical system failures and appliance defects, but many more are caused by the misuse and poor maintenance of electrical appliances, incorrectly installed wiring, and overloaded circuits and extension cords. •Never use anything but the proper fuse to protect a circuit. •Find and correct overloaded circuits. •Never place extension cords under rugs. 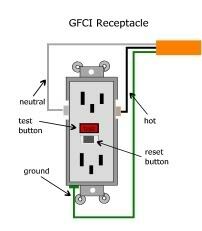 •Outlets near water should be GFCI-type outlets. •Don’t allow trees near power lines to be climbed. •Keep ladders, kites, equipment and anything else away from overhead power lines. Electricity enters the home through a control panel and a main switch where one can shut off all the power in an emergency. These panels are usually located in the basement. Control panels use either fuses or circuit breakers. Install the correct fuses for the panel. Never use a higher-numbered fuse or a metallic item, such as a penny. If fuses are used and there is a stoppage in power, look for the broken metal strip in the top of a blown fuse. Replace the fuse with a new one marked with the correct amperage. Reset circuit breakers from “off” to “on.” Be sure to investigate why the fuse or circuit blew. Possible causes include frayed wires, overloaded outlets, or defective appliances. Never overload a circuit with high-wattage appliances. Check the wattage on appliance labels. If there is frayed insulation or a broken wire, a dangerous short circuit may result and cause a fire. If power stoppages continue or if a frayed or broken wire is found, contact an electrician. •Routinely check your electrical appliances and wiring. •Hire an InterNACHI inspector. InterNACHI inspectors must pass rigorous safety training and are knowledgeable in the ways to reduce the likelihood of electrocution. •Frayed wires can cause fires. Replace all worn, old and damaged appliance cords immediately. •Use electrical extension cords wisely and don’t overload them. •Keep electrical appliances away from wet floors and counters; pay special care to electrical appliances in the bathroom and kitchen. •Don’t allow children to play with or around electrical appliances, such as space heaters, irons and hair dryers. •Keep clothes, curtains and other potentially combustible items at least 3 feet from all heaters. •If an appliance has a three-prong plug, use it only in a three-slot outlet. Never force it to fit into a two-slot outlet or extension cord. •Never overload extension cords or wall sockets. Immediately shut off, then professionally replace, light switches that are hot to the touch, as well as lights that flicker. Use safety closures to childproof electrical outlets. •Check your electrical tools regularly for signs of wear. If the cords are frayed or cracked, replace them. Replace any tool if it causes even small electrical shocks, overheats, shorts out or gives off smoke or sparks. REMEMBER, ELECTRICITY CAN KILL. HIRE A LICENSED AND INSURED ELECTRICAL CONTRACTOR. The U.S. Fire Administration reports that more than 403,000 home fires occurred in the U.S. in 2008, causing 2,780 deaths and more than 13,500 injuries. Some fires are caused by issues related to the structure, such as lightning strikes, faulty wiring, furnace malfunctions, and other electrical and heating system-related mishaps. But most home fires are preventable. According to an April 2010 report by the National Fire Protection Association, adults over the age of 75 are almost three times more likely to die in a home fire than the rest of the general public. The NFPA’s fire prevention program promotes the following eight tips that elderly people – and people of all ages – can use. 1. Plan and practice your escape from fire. We’ve heard this advice before, but you can’t be prepared to act in an emergency if you don’t have a plan and everybody knows what that plan is. Panic and fear can spread as quickly as a fire, so map out an escape route and a meeting place outdoors, and involve even the youngest family members so that everyone can work as a unit to make a safe escape. If you live in a condo or apartment building, make sure you read the signs posted on your floor advising you of the locations of stairways and other exits, as well as alarm pull stations and fire extinguishers. 2. Plan your escape around your abilities. Keeping a phone by your bedside will allow you to call 911 quickly, especially if the exits of your home are blocked by smoke or flames. Keep a pair of shoes near your bed, too. 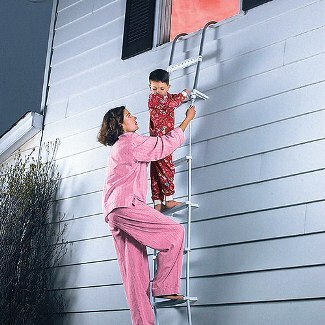 If your home or building has a fire escape, take some time to practice operating it and climbing it. 3. Smoke alarms save lives. If you don’t already have permanently installed smoke alarms hard-wired into your electrical system and located outside each bedroom and on each floor, purchase units and place them in those locations. Install them using adhesive or screws, but be careful not to touch your screwdriver to any internal wiring, which can cause an electrostatic discharge and disable them. Also, install carbon monoxide detectors, which can protect family members from lethal poisoning even before a fire starts. 4. Give space heaters space. Whether saving on utility bills by using the furnace infrequently, or when using these portable units for spot heat, make sure you give them at least 3 feet of clearance. Be sure to turn off and unplug them when you leave or go to bed. Electrical appliances draw current even when they’re turned off, and a faulty one can cause a fire that can spread through the wires in the walls at a deadly pace. 5. If you smoke, smoke outside. Not only will this keep your family members healthier and your home smelling fresher, it will minimize the chance that an errant ember from your cigarette will drop and smolder unnoticed until it causes damage. 6. Be kitchen-wise. This means monitoring what you have on the stove and keeping track of what’s baking in the oven. Don’t cook if you’re tired or taking medication that clouds your judgment or makes you drowsy. Being kitchen-wise also means wearing clothing that will not easily catch on the handles of pots and pans, or graze open flames or heating elements. It also means knowing how to put out a grease fire; water will make it spread, but salt or baking soda will extinguish it quickly, as will covering the pot or pan with a lid and turning off the stove. Always use your cooktop’s vent fan while cooking. 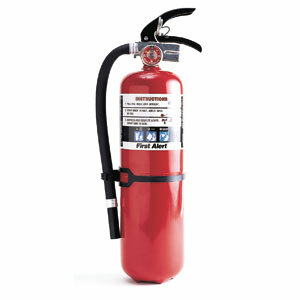 Keep a small, all-purpose fire extinguisher in a handy place, such as under the sink. These 3-pound lifesavers are rated “ABC” for their fire-suppressing contents: “A” puts out ignited trash, wood and paper; “B” acts on grease and other flammable liquids; and “C” deals with small electrical fires. Read the instructions on these inexpensive devices when you bring them home from the store so that you can act quickly, if the time comes. If your fire extinguisher is somewhat old because you’ve yet to use it, turning the canister upside-down and tapping the bottom will help agitate the contents and prevent them from caking, and possibly clogging the nozzle at the time of use. It’s also a good idea to stow an extra fire extinguisher near the bedrooms. If an emergency arises and you find yourself trapped by an uncooperative window, you can use the canister to smash through it. 7. Stop, drop and roll. Fight the urge to panic and run if your clothes catch fire because this will only accelerate its spread, since fire needs oxygen to sustain and grow. Tamping out the fire by rolling is effective, especially since your clothes may be on fire on your back or lower body where you may not be immediately aware of it. If ground space is limited, cover yourself with a blanket to tamp out any flames, and douse yourself with water as soon as you can. Additionally, always stay close to the floor during a fire; heat and smoke rise, and breathable air will normally be found at the floor-level, giving you a greater chance of escape before being overcome by smoke and toxic fumes. Also, before exiting a closed room, be sure to test the doorknob for heat before opening the door. A very hot doorknob indicates that fire could be lurking just outside; opening the door will feed the fire an added surge of oxygen, potentially causing an explosive backdraft that can be fatal. 8. Know your local emergency number. People of all ages need to know their emergency number (usually, it’s 911). Posting it near the phone and putting it on speed-dial will save precious moments when the ability to think clearly may be compromised. •Make sure your electrical system is updated, and that you have appropriate AFCI and GFCI receptacles. Have your system inspected by an InterNACHI inspector or a licensed electrician to make sure your electrical needs are not taxing your electrical system. 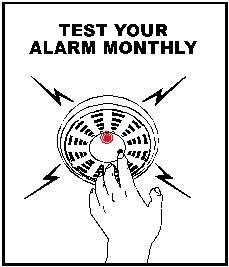 •Make sure you have smoke alarms and carbon monoxide detectors installed. Test them to make sure they’re working properly, and change their batteries at least annually. •Check to see that your house number is clearly visible from the street, and unobstructed by any tree branches or structural overhangs. If first-responders are called to your home to put out a fire, make sure they can find you. •Be aware of lit candles. Never leave them unattended, and always blow them out when leaving home or going to bed. This is especially important during the holidays when candles are used as holiday decorations. Also, keep them out of the way of drapes and plants, and out of reach of children and especially pets, whose tails can accidentally knock over a candle or come into contact with its flame. •Never use barbecue grills indoors, either for cooking or as a heat source. The carbon monoxide they emit cannot be adequately vented, and their flammable materials pose safety hazards. Also, do not use the oven to heat the indoors. Space heaters are safer and more energy-efficient. Ask your InterNACHI home inspector to perform an energy audit to find heat leaks, and to suggest low-cost ways to keep your home warm and comfortable during cold weather. •Consider getting rid of your electric blanket. The fire hazards associated with them make the prospect of trading them in for a thick comforter or multiple blankets much less worrisome. When their embedded cords become bent, the internal wiring can break, causing them to short out and start an electrical fire. •Be extra-vigilant when using hot pads, hot plates, Bunsen burners and portable cooktops. They can overheat and burn the surface they’re sitting on, or burn through a cup or pot sitting on top, which can lead to smoke and fire. Never leave these unattended, and always unplug (or extinguish) them when not in use. •Unplug portable electronic devices and other small appliances when not in use. Coffeemakers, blow dryers and other devices we use daily still draw current when they’re plugged in, even if they’re turned off. A faulty device can cause an electrical fire that can be devastating. One family in Boulder, Colo., returned home one day to discover their house burned to the ground; the fire marshal discovered that the cause was a switched-off curling iron that was left plugged into the wall’s outlet. Get into the habit of unplugging, just to be safe. 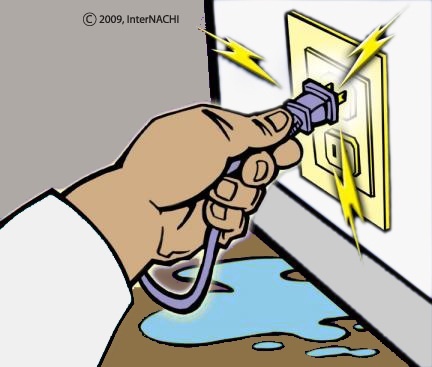 •Use extension cords sparingly, and always unplug them when not in use. Some electrical devices work best when plugged directly into the wall’s receptacle or outlet, especially if they have a ground wire (which you should never cut off). Devices plugged into extension cords can easily overheat (themselves or the extension cords), damaging wires within walls and weakening your electrical system, potentially causing an electrical fire. Always check for the UL-listed label on extension cords. Remember that they also pose a tripping hazard, which is another reason to minimize their use. •Clean your clothes dryer’s lint trap after each use. Your dryer should vent directly to the outdoors. Check to make sure that there are no obstructions in the vent hose, such as birds’ nests, foliage or other debris. The vent should have a damper to keep wildlife and debris out, but it should not have a screen, which can trap combustibles, allowing them to accumulate, heat up, and possibly catch fire. •If you have a fireplace, remember to have it professionally inspected and cleaned periodically by a chimney sweep. Creosote buildup can cause a fire that may unexpectedly back into the living space. Make sure your damper is working properly, and that the chimney lining is in good condition. The next time your InterNACHI inspector inspects your roof, s/he can check for adequate flashing around the chimney, as well as its structural integrity. Make sure the fire is completely out before you leave the home. Keep all kindling and combustibles a safe distance away from the mouth of the fireplace. Make use of a screen at the hearth to prevent embers from escaping. And avoid burning green wood, which doesn’t burn as evenly or safely as dry wood. All new residential construction requires the installation of smoke alarms, usually on each floor of the home, as well as outside each sleeping area. Many newer smoke alarms can also detect carbon monoxide. This silent and odorless killer is one of the primary causes of accidental death because family members can be fatally poisoned while sleeping. Smoke alarms come in two types. Photoelectric alarms can sense smoky and smoldering fires. Ionization alarms are quicker at detecting flames and fast-moving fire. Dual-sensor smoke alarms combine both these features, and are recommended by the USFA because it’s impossible to predict the type of fire that may erupt in a home. There are also smoke alarms that vibrate and/or flash strobe lights to alert home dwellers who are vision-impaired or hard of hearing. The leading U.S. manufacturer of residential smoke alarms, as well as home fire extinguishers, is Kidde. Their dual-sensor smoke alarms were the subject of a voluntary recall by the U.S. Consumer Product Safety Commission in the summer of 2009 because of a malfunction caused by an electrostatic discharge created during their installation, rendering them inoperable. Make sure that you install any portable smoke alarms and carbon monoxide detectors safely, and test them after installation. You can also ask your local fire department to do this for you. Many smoke alarms are hard-wired into the home’s electrical system, but may still have batteries for backup in the event of a power outage. They also typically have a test button. Make sure you test them once a month, and replace the batteries once a year. If you hear a chirping noise, this is a signal that the batteries are weak and need replacing. Some smoke alarms have “nuisance” buttons. If you burn something that you’re cooking and accidentally set off the alarm, you can press the nuisance button to turn it off. Remember not to actually disable the alarm; you may forget to reset it later. Simply clear the room of smoke instead. Under most standard homeowners and even renters insurance policies today, having smoke alarms, carbon monoxide detectors and fire extinguishers in the home will qualify policyholders for rebates and discounts on their premiums. Some newer homes now have sprinkler systems, and various municipalities around the U.S. are mandating their installation, depending on the square footage of the home. In summary, installing dual-sensor smoke alarms and carbon monoxide detectors, as well as taking some common-sense precautions and performing regular household maintenance, will help keep your family safe from the destructive and potentially lethal effects of a house fire. There has been much debate on where to mount your Carbon Monoxide detector, well hopefully this article will help. Where to Mount a Carbon Monoxide Detector? So you just bought a carbon monoxide detector to put in your home. You feel a sense of security wrap around your body as your plug it into the electrical socket near the ground. Stop right there though. You just made a crucial mistake that many other people make when choosing the location to mount their carbon monoxide detector. It is known that some companies recommend mounting their units near the floor, but in general it is a potential risk due to the chemical properties of carbon monoxide. The key point that we want to focus on is the specific gravity of CO which is 0.966. Compared to the air we breathe (1.0), carbon monoxide is slightly lighter which means it will rise. Having a carbon monoxide detector mounted near the ground means there is the possibility that it may not detect CO when it is present in your home. Consequently, you will want to mount carbon monoxide detectors on the ceiling the same way you would mount a smoke alarm. Additionally, here are some other guidelines you should follow when choosing a mounting location. You will want to keep CO detectors out of bathrooms or any other humid areas. You will also want to place them at least 15 feet away from heating or cooking appliances. Placing a CO dectector near a furnace may also set off false alarms since these devices are known to emit a small amount of carbon monoxide upon start-up. ARE YOUR LISTINGS NOT SELLING? Have you considered a Pre-Listing Inspection. *It allows you to see your home through the eyes of a critical third party. *It helps you to price your home realistically. *Defects won’t become negotiating stumbling blocks later. *There is no delay in obtaining the Use and Occupancy Permit. *You have the time to get reasonably priced contractors or make the repairs yourself, if qualified. *It may encourage the buyer to waive the inspection contingency. *It may alert you to items of immediate concern, such as radon gas or active termite infestation. *It may relieve prospects’ concerns and suspicions. *It reduces your liability by adding professional supporting documentation to your disclosure statement. *It alerts you to immediate safety issues before agents and visitors tour your home. *Yard Sign to let prospective buyers know the home has been inspected. *After the inspection you have the choice to make any needed repairs. I will come back and certify that the repairs were made at no additional fee. *One copy of the report in our custom binder and up to 25 additional copies (w/o binder). Never hire an inspector who is not a member of InterNACHI, which provides the most trusted and rigorous training for inspectors in the industry. Copies of the inspection report, along with receipts for any repairs, should be made available to potential buyers.